What happens at an ECG? What will the tests show? What happens next? What happens at an ECG? You can carry on with all your normal activities as usual before an ECG recording. You can eat, drink and take medication as normal on the day. Several small electrodes (sticky pads) will be placed on your chest, arms and legs. These will be connected to the ECG recording machine. The ECG recorder picks up the electrical signals that are produced by each heart beat. This will be recorded on a graph and printed out for the GP. The ECG machine can only record electrical signals from your body. It does not give out electrical shocks and does not affect your heart in any way. An ECG detects any irregularities in your heart rhythm. It can also tell if your heart is enlarged or is working under strain. 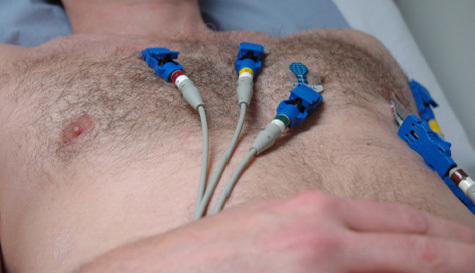 ECGâ€™s are performed for many reasons. Listed below are four of the most common reasons for recording an ECG. An abnormal reading does not always mean there is something wrong, and further investigations are sometimes necessary. The printed ECG recording is analysed, then reported upon by a Consultant Cardiologist and the results forwarded to your GP who will interpret them and give you the formal result at your next appointment.